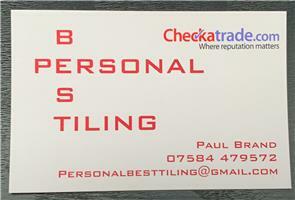 Personal Best Tiling Ltd - Tiler - Tiling based in Beckenham, Kent. My name is Paul, I am a trustworthy, reliable Tiler who thrives on perfection and takes pride in all of my projects, I have over 10 years experience in the industry I can assist clients every step of the way with no job being too big or small. I currently have 2 years experience as a stone mason I am a highly skilled, qualified and dedicated professional. I specialise in domestic tiling such as bathrooms, kitchens, hallways, conservatories and all other aspects of wall & floor tiling. My portfolio also includes commercial projects such as schools, restaurants, new builds, house renovations and refurbishments, all aspects of commercial & domestic tiling including ceramic, mosaics & geometric pathways, marble & slate. Please feel free to contact me for a quote. I look forwards to hearing from you.